Jaime Garcia is the son of Jose Pepin Garcia, world renowned master cigar maker and blender. The Reserva Especial is Jaime's first namesake, but not his first blend. Jaime is famous for producing a highly rated complex blend of rare, sungrown Ecuadorian Habano-Rosado wrapper and Nicaraguan filler and binder he named "My Father" in honor of his father. 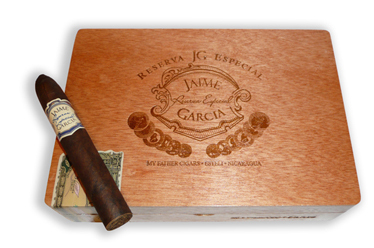 The Jaime Garcia Reserva Especial cigar is made at My Father Cigars in Esteli, Nicaragua, with a blend of two Nicaraguan tobaccos - one grown by Jaime and his father, Pepin, and the other by the Oliva Tobacco Company of Tampa, FL. The cigars are finished with a dark, oily Connecticut Broadleaf wrapper and deliver an enjoyable medium-bodied smoke with flavors of sweet spices, nuttiness, and chocolate.